Do you agree with me that certain foods should not be transformed and processed through cooking? Lettuce, cucumbers, grapefruits, and kiwi fruit fall into this category. Lettuce will loose all its fresh crispness and become a wilted watery lukewarm pathetic vegetable. Cucumbers, due to their high water content, will have similar results as lettuce. Grapefruit I find best raw, either in form of its segments in a salad or juiced. A few weeks back I was asked to come up with a recipe that includes kiwi fruit. I was at a total loss. What can you do with kiwi without destroying its delicate flavor and texture? I was hoping to get some inspiration through Google, but nothing came up that would tickle my fancy. In fact, most recipes confirmed my argument that kiwi fruit should be left raw, and just be added to salads. During our summer vacation in Europe, I bought an ice cream maker as my husband loves sorbet. We have been making sorbet out of many fruits. Many of them were raw, pureed fruit sweetened with a little honey and with some fresh lemon juice to add some zing. In fact, these kind of sorbets are a perfect way to get some raw fruit into people who are otherwise not great fruit lovers. Making kiwi sorbet would be worth a try! My very first attempt was a total success, and I must say that of all sorbets that we have made (raspberry, mango, pineapple, citrus fruit), I find the kiwi sorbet the most addictive. A dessert that is a vitamin C bomb in disguise. To be eaten without any guilty feelings. Give it a go! I bet you will like it. Peel the kiwi fruits and chop them roughly. Blend kiwis in food processor until smooth. Add lemon juice and honey and pulse until well combined. Alternatively, chill the mixture in the fridge until thoroughly cooled. Pour the kiwi mixture into a shallow bowl or pan. Freeze until almost solid. Take out of the freezer, and thoroughly stir it with a fork. Put back into freezer and freeze until solid. 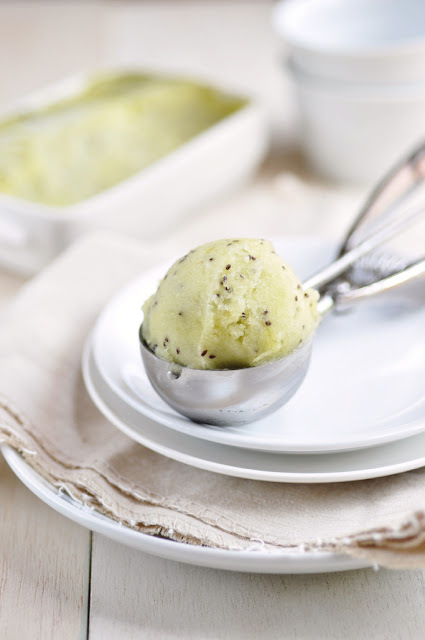 You may want to take out the sorbet and leave it at room temperature for 10 minutes before serving to soften the sorbet and make scooping easier.